From the day it opened in April 2011, Manhattan Beach Post (aka M.B. Post) has been a hit with enthusiastic locals and visiting foodies who pack the lively “social house” for Chef David LeFevre’s playful, refined menu of shared plates. The critics have sung their praises as well: LA Times restaurant critic S. Irene Virbila named M.B. Post one of the Best Meals of 2011, praising LeFevre’s “gutsy global cooking” and comparing it to a culinary Around the World in 80 Days. 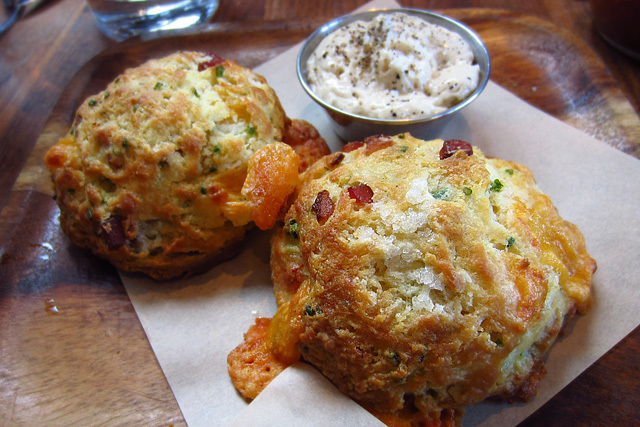 Jonathan Gold singled out the bacon cheddar buttermilk biscuits as one of LA Weekly’s 10 Best Dishes of 2011: “…it is impossible to visit M.B. 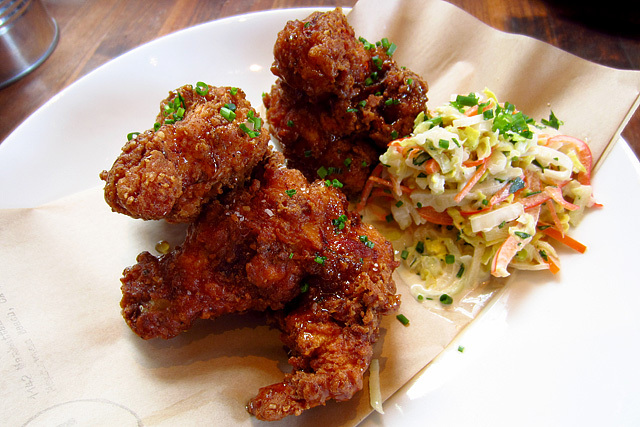 Post without wolfing down at least one order of these, and maybe getting another for the road.” And in his 2011 Best of Food GPS, Joshua Lurie concurred with Gold and awarded M.B. Post with Biscuits of the Year, as well as Pretzels of the Year. 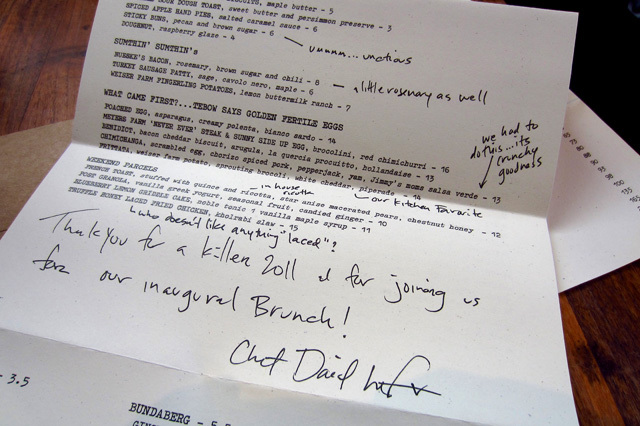 The Post Bangin' Brunch Menu, with Chef David LeFevre's handwritten notes. Fans will be glad to know that one of 2011’s top new restaurants just got even better with the debut of the Post Bangin’ Brunch, a weekend menu that expands the restaurant’s repertoire of shared small plates to feature LeFevre’s take on traditional brunch favorites. After a short drive on a beautiful Saturday morning, my Brunch Companion and I were seated on the first day of brunch service, which began on January 7th after a sneak preview on January 2nd. 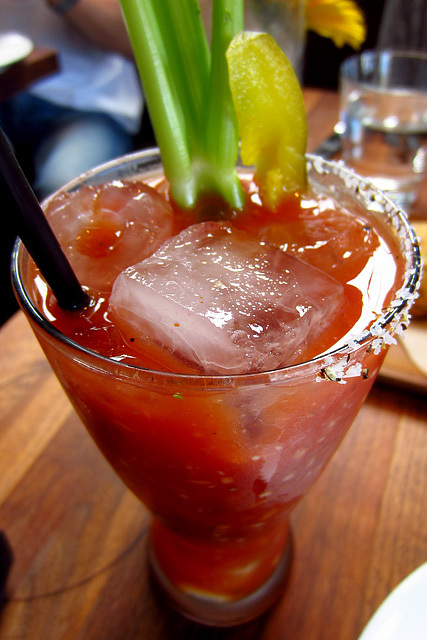 The brunch menu features eight craft cocktails, priced at $12. 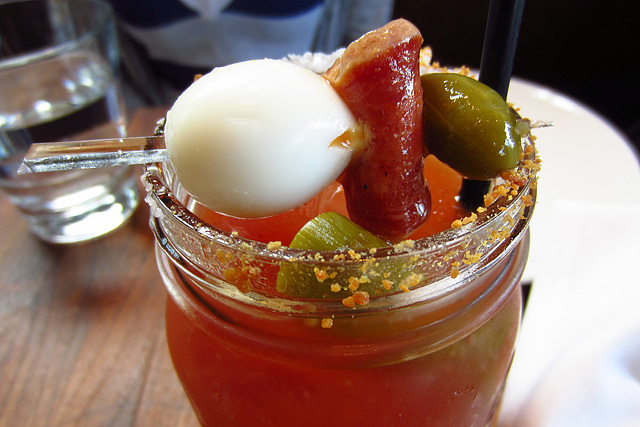 The BC’s attention was immediately drawn to the Coughlin’s Law: a Red Eye variation with Tito’s Vodka, Belgian Pilsner, tomato, dill, bacon, and quail egg. 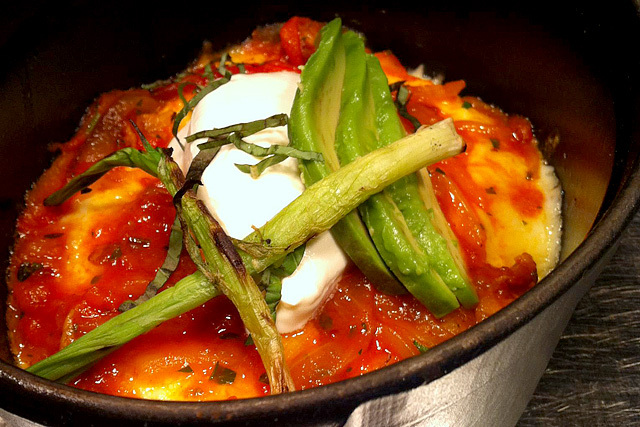 It was a great choice that paired well with a couple of our dishes as the brunch progressed. 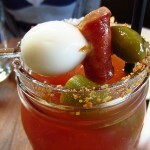 I had a traditional Bloody Mary (likewise with Tito’s), a nicely done version with a healthy kick of horseradish. To start, we ordered the aforementioned Bacon Cheddar Buttermilk Biscuits with maple butter ($5) and the Sticky Buns with pecan and brown sugar ($6). 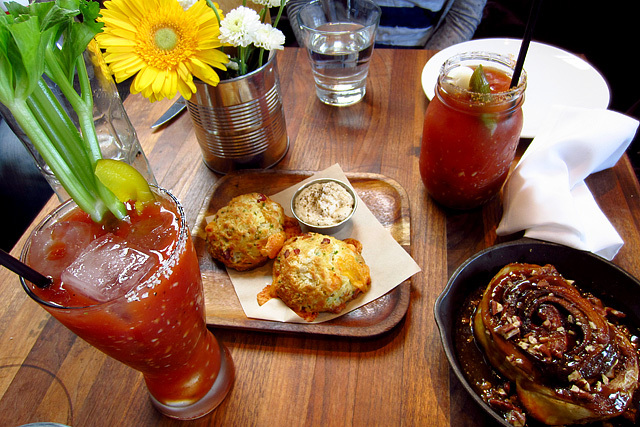 The biscuits were as great as ever, and the flaky, savory bites were perfectly matched with the spicy sips of the Bloody Mary. 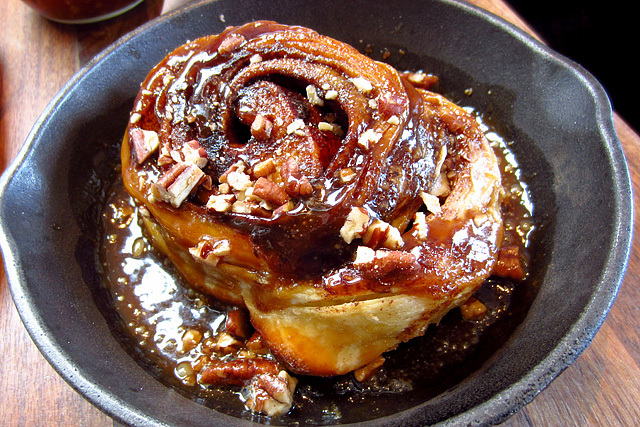 We enjoyed a few bites of the sticky buns but opted to save the rest for coffee. Poached Egg with asparagus, creamy polenta, Bianco Sardo. 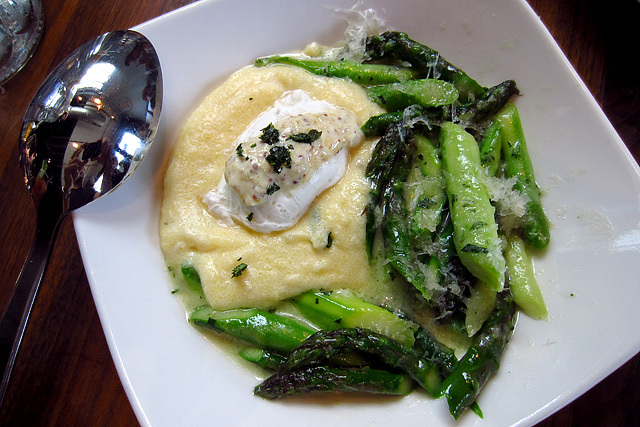 The BC chose the winner of the meal: Poached Egg with asparagus, creamy polenta, Bianco Sardo ($14). Letting the yolk run into the polenta and sopping it up with the asparagus was just one of the pleasures to be had from a dish that the BC enthusiastically called “perfect.” The Bianco Sardo added subtle earthy, nutty notes to each bite. The Truffle Honey-Laced Fried Chicken with kohlrabi slaw ($15) was very good, though not in the same swoon-inducing league as the poached egg. The salty-sweet skin had a nice crispness and the meat was tender and juicy; it’s a brunch item ready-made to enjoy with the Coughlin’s Law. The slaw could benefit from a hit of acid for more bite. As full as we were, we had only scratched the surface of the brunch menu. Over at the next table, a guest enjoyed a dish that LeFevre’s handwritten menu notes called “our kitchen favorite”: the Frittata with Weiser Farm potatoes, sprouting broccoli, white cheddar, piperade ($14). Other dishes to try on future visits include the Benedict with bacon cheddar biscuit, arugula, La Quercia prosciutto, hollandaise ($13) and the French Toast stuffed with quince and ricotta, star anise macerated pears, chestnut honey ($12). The Post Bangin’ Brunch menu is served at M.B. Post from 10am to 1:30pm on Saturday and Sunday.